To win in business, it requires limitless efforts and hard work but before you ork on it, its highly recommended to know those 7 important key elements that will give you a cutting edge idea of project planning. As we all know, planning is the first and foremost key to succeed. Similarly, if you are starting up a new business or simply planning to expand the existing one, its important that you know how to make a business plan that works for you and helps your business proposal to pass. 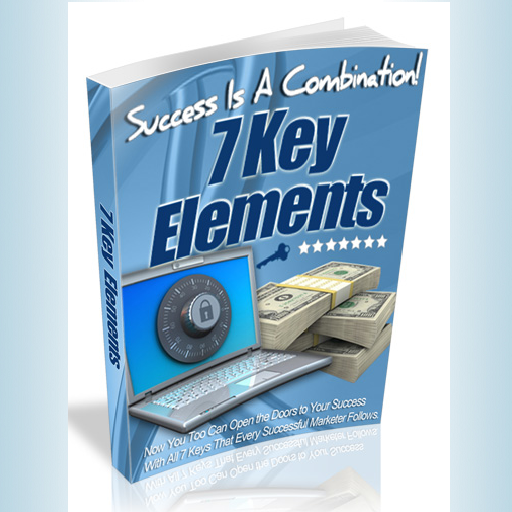 The 7 key elements is a popular app designed to fit in the needs of enterpreneurs. By downloading this app on your smartphones, these 7 key ideas help you write a business plan that potential investors will embrace. 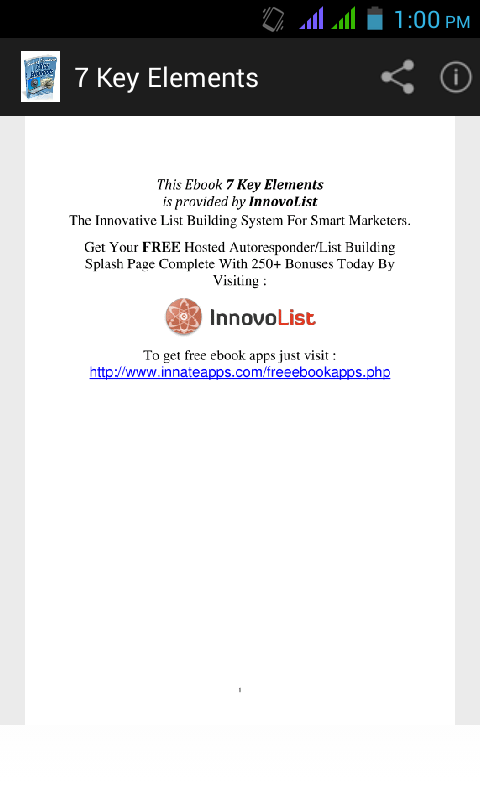 It is the best selling app ebook on amazon appstore and Google Playstore. Not only this, but the good thing about this app is that besides being so useful, informative and popular online, it is available for free. What else can better than this. So, don't lose the opportunity to get this incredible app on your smartphones now. Even if you are in the very first beginning stages of your business, these financial statements will help you in developing self confidence within you while side-by-side developing a good financial plan. Every page in this ebook app is devoted to analyzing, explaining and presenting practical instructions on developing a business plan relevant to today's marketplace and lending landscape. 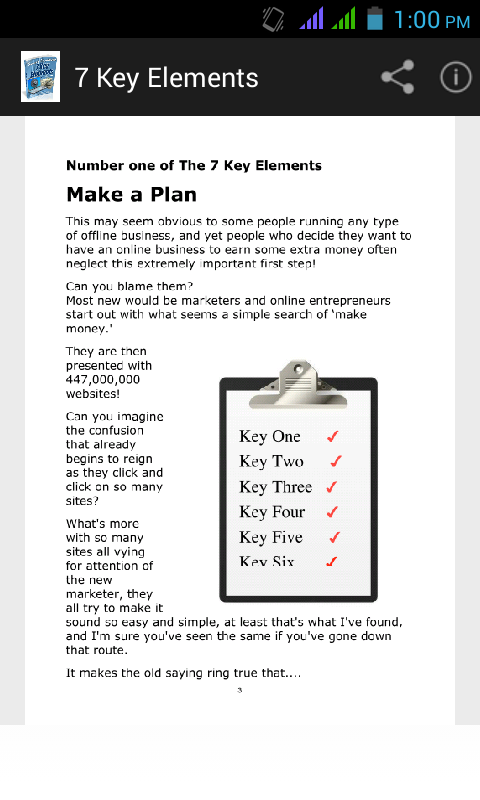 Make a Plan :- This may seem obvious to some people running any type of offline business, and yet people who decide they want to have an online business to earn some extra money often neglect this extremely important first step! In other words I hope you've made a start on Making a Plan! Staying Focused :- If you're following along with me so far you should now have some ideas written down ready to develop a Plan. You may even have some initial thoughts on how you can start Taking Action to get your Plan and ideas up and running. So moving on to another Key Every Successful Marketer Follows... Staying Focused And Sticking to Their Plan. Thousands of would be marketers do get this far. Then it all starts to fall apart for them. 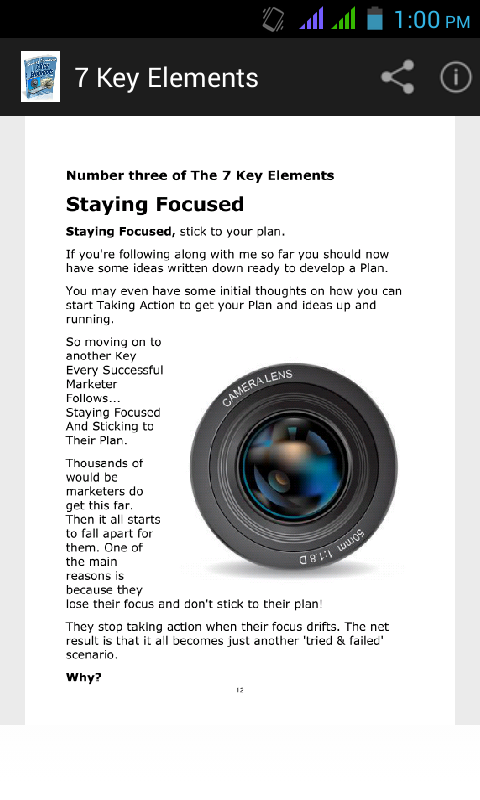 One of the main reasons is because they lose their focus and don't stick to their plan! Avoid Distractions :- How are things moving along for you? Naturally I realize that reading thru as you might be isn't giving you much time to make your plans and take action on them straight away. If you're making notes and taking action after each chapter, Then you'll find it easier to move things along. Keep It Going :- Hey we're really moving along now. If you've been following me and taking notes, you should now be thinking about what happens next. We established what you need to do if you want to follow the successful marketer so far is, to make a plan, take action, stay focused and stick to your plan, and finally, avoid distractions.